Don’t even think of looking for his page on Facebook. Or anywhere else on the web. You just won’t find him there. Dumé Cesari is a man of nature and action. And to be honest, it’s not even sure the internet has reached the lone Corsican village where he manufactures his delicatessen yet. May this last forever, for we have never tasted more subtle ham than the one he dedicates his long working days to. Try this: go to the nearest supermarket and get your hands on a saucisson. On the label, you’ll that it was aged somewhere between 15 and 20 days. Basically half a month. If you were to order Dumé a dry sausage, you wouldn’t be able to share it before a good 4 or 5 months, for the youngest. That’s the amount of time he puts into aging to for this type of piece. We are talking Coppa, Salamu, U Lonzu, Salcicetta or U figateddu. Same for the ham. 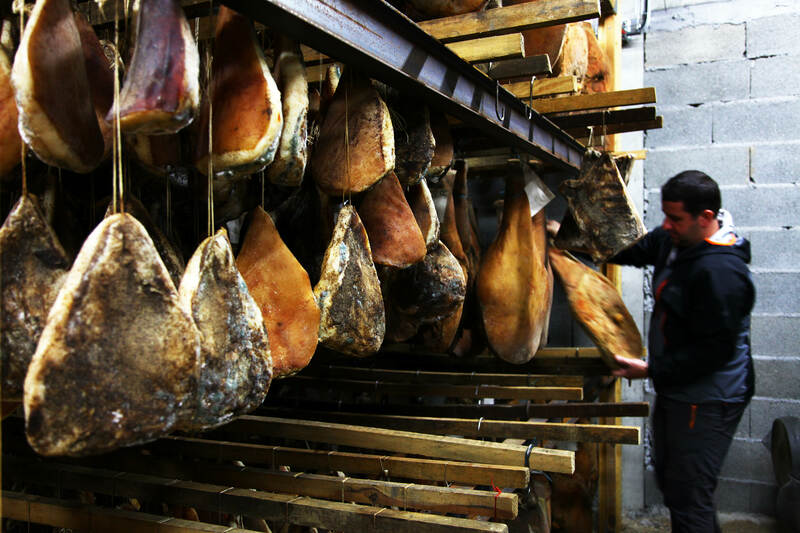 While the dry ham you find in your average lunch sandwich has barely matured for a few month, if it’s matured at all, Dumé’s Corsican ham (U Prisuttu) hangs to the ceiling for 13 to 14 months for the youngest. The oldest and biggest won’t leave the room before two, or even three years! But why does it matter after all? Well similarly to cheese, aging deepens flavours and allows new ones to arise. In our case of Corsican cured meat, they’ll typically be nutty ones. Of course, this is all about recipes and techniques too. It goes without saying, Dumé uses only natural products, and does everything manually. First, there is the drying with chestnut wood. Dumé lights a fire twice a week for 15 days to dry the meat naturally and bring it a smokey taste. And then when they’ve lost 25% of their weight (all that water gone means more taste again), the various hams and sausages are taken down the cellar where they’ll be left alone to age quietly in the dark. Now are time and recipes the only ingredients for such success? Course not. There is always more to it. We are talking picturesque village and enchanting surroundings. Dumé lives in Cozzano, on the high Taravo, together with fewer than 200 souls in the winter.